Bright, white, sleek and powerful, the Royal Oak Concept GMT Tourbillon ref. 26580IO.OO.D010CA.SDT has been presented at the SIHH —Salon International de la Haute Horlogerie— 2014 in Geneva. The watch is just amazing in person and this is a watch that caters to serious avant-garde collectors and connoisseurs. Its sculpted titanium case middle and integrated rubber strap combine with a white ceramic bezel to frame the highly architectural array of tourbillon carriage and second ‘GMT’ time-zone display inside —case and movement in perfect harmony. 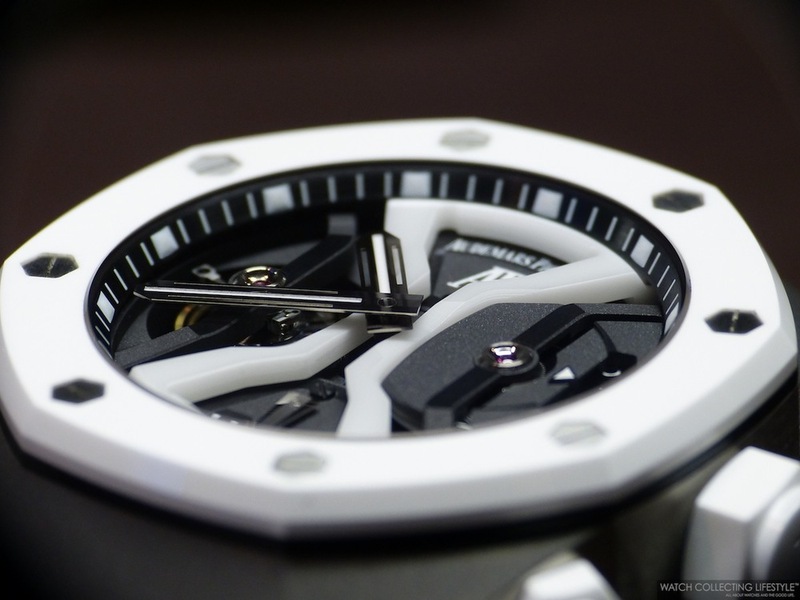 New for 2014, however, is the flash of pure white center-stage: an intricately machined upper bridge made of white ceramic —only possible now, thanks to Audemars Piguet’s ongoing advances in materials science. As you will be able to appreciate in the pictures, the anti-reflective treatment on the front and back crystals is extraordinary. This year’s Royal Oak Concept GMT Tourbillon features a white ceramic bezel, crown and push pieces instead of black, all heightening the contrast with the titanium case middle. However, in typical, trailblazing style, the manufacture has now gone one step further and incorporated ceramic into the movement itself, replacing the blackened upper bridge of Calibre 2913 with white ceramic. As a result, the new Calibre 2930 is visually transformed, its dazzling, hourglass-shaped bridge further enlivened by the double symmetry of the tourbillon bridges and GMT display. Now enjoy these images we have taken just for your viewing pleasure. Sticker Price $202,100 USD. For more info on Audemars Piguet SIHH 2014 novelties click here. Posted on January 22, 2014 by Editor & Publisher and filed under Audemars Piguet, SIHH and tagged Royal Oak Concept GMT Tourbillon ref. 26580IO.OO.D010CA.SDT Audemars Piguet Royal Oak Concept Tourbillon GMT Ceramic 2014.